Engineer Talks Tech with Congressional Staff in Washington, D.C.
Electrical engineering professor Patrick Mercier demonstrates the temporary tattoo alcohol biosensor and other UC San Diego wearable technologies to Congressional staff members. In the wake of the March for Science, scientists and science supporters worldwide are actively seeking ways to connect and engage with their political representatives, in hopes of bridging the gap between science and public policy. Patrick Mercier, an electrical engineering professor at UC San Diego, got the chance to do just that at an event on Capitol Hill in Washington, D.C. He met with staff members working for representatives for San Diego County and for California Senator Dianne Feinstein. He also showcased research projects conducted under the umbrella of the Center for Wearable Sensors at the Jacobs School of Engineering at UC San Diego. 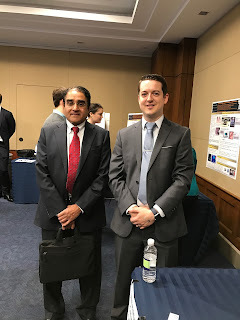 The event was the BioMedical Technology Exhibition hosted by the American Institute for Medical and Biological Engineering (AIMBE) in partnership with the Congressional Research and Development Caucus and the Congressional Robotics Caucus. Mercier was among a group of researchers to present their cutting-edge technologies to Congressional staff in the U.S. House of Representatives. The event took place on May 5, 2017. Researchers from several universities and institutions provided live demonstrations of their federally-funded biomedical engineering devices and technologies that have the potential to revolutionize access to health care. These researchers also participated in 18 meetings with Congressional staff, facilitated by AIMBE — the first step in starting a dialog and becoming a trusted advisor to their lawmakers. At the exhibition, Mercier showcased several technologies that he, along with nanoengineering professor Joseph Wang, developed at UC San Diego: a temporary tattoo that monitors blood alcohol levels from sweat; a “Tricorder-like” device that can be worn on the chest to simultaneously measure heart rate and lactate levels; and MouthSense, which is a mouth guard sensor that monitors biomarkers in saliva such as lactate, cortisol and uric acid. These technologies demonstrate how UC San Diego researchers are developing wearable devices that can be seamlessly integrated into everyday life to provide continuous, non-invasive and real-time health monitoring. Left: Mercier discusses NIH-funded research with Congressional staffers. Right: Mercier with Krishna Kandarpa, Director of Research Sciences & Strategic Divisions at the National Institute of Biomedical Imaging and Bioengineering. “All staff members, particularly those in our local offices were very enthusiastic about the technology we’ve developed and are encouraged that investment in NIH research leads to new and interesting devices that can potentially help improve healthcare and lower costs,” Mercier said. Such investment, he said, facilitates commercialization of innovative, early-stage technologies such as MouthSense, which Mercier and Wang spun off as a startup. 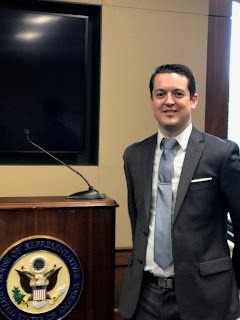 Mercier met with a variety of Congressional staff members, including those from the offices of San Diego county Congress members Scott Peters, Darrell Issa and Susan Davis, as well as the office of California Senator Feinstein.